The essence of the Kanban approach to agile project management lies in using visuals. The best form of using a real physical whiteboard and present it face to face. However, this is not always possible, especially if working with remote teams. 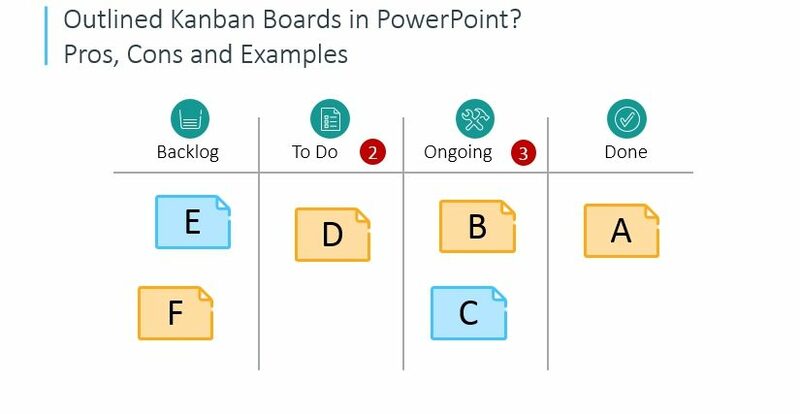 We discuss here pros and cons of using Kanban boards made in PowerPoint. Plus I am adding several examples how Kanban boards can look like. Disclaimer: The Kanban graphics I present here comes from commercial Kanban PPT Template that we’ve designed. You’re welcomed to support our work by purchasing it (see the source by clicking the pictures). Kanban is a visual project management system. The roots of this method come from Toyota’s work management approach that was using visual cards. Kanban today is used a lot in Agile project management. When using Kanban, you manage tasks workflow using cards placed over columns, from Backlog column towards Done column. One of the rules it to limits Work in Progress – the number of task cards the team is currently working on. in personal task management for private planning. There are Kanban apps also for kids – as this system is attractive to work with also for younger generations. flexible editability of the board. You can place task note wherever you like, use as many colors as you like. It’s easy to introduce your own visual system, use brand colors to fit your company style, add or remove swim lanes or columns, as many as you like. printing out the board is as easy as printing a page from any office app. 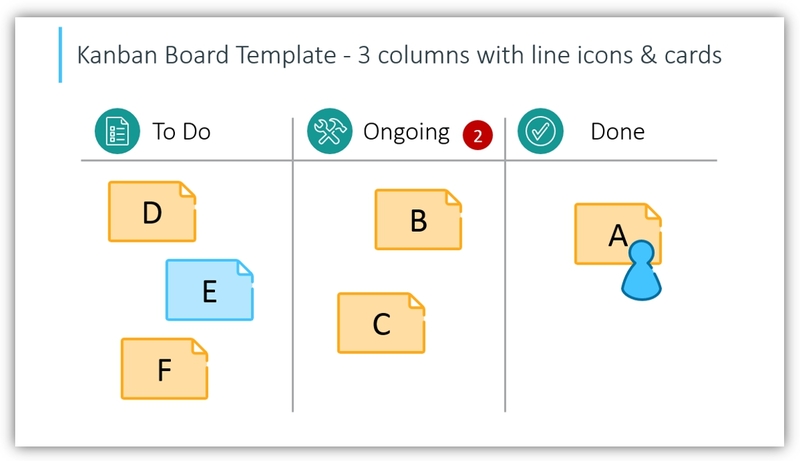 time saving – using the predefined template over and over saves you time redrawing the boards with each new iteration. Additionally,y if you will use one consistent graphical style of all Kanban elements, the boards will look professional as made by the designer. Board margins – have enough white space around a board and inside it, too. Don’t stuff too many cards. Don’t place board too close to slide edge, or your presentation will look unreadable. Alignment of Kanban elements – remember to check the alignment of cards in rows or columns. You can use PowerPoint distribute and align functions or smart guides for that (see top PowerPoint menu and check the Formatting tab). the process is not automated. You need to manually place the cards and keep track of their dynamics. You can tackle it by keeping the history of boards. Simple slide duplicate will do (click on slide thumb and use key shortcut Ctrl+D) along noting the date of the slide. you don’t have any analytics considering the team performance, unless you do it manually, or invent a way how to connect PPT with some data collection system. Comparing to physical whiteboards, the PPT boards give less space for creativity. Drawing on paper or real board gives our brain a creative kick. We don’t loose ourselves in choosing colors or images. With hand drawing, we don’t need to look perfect. 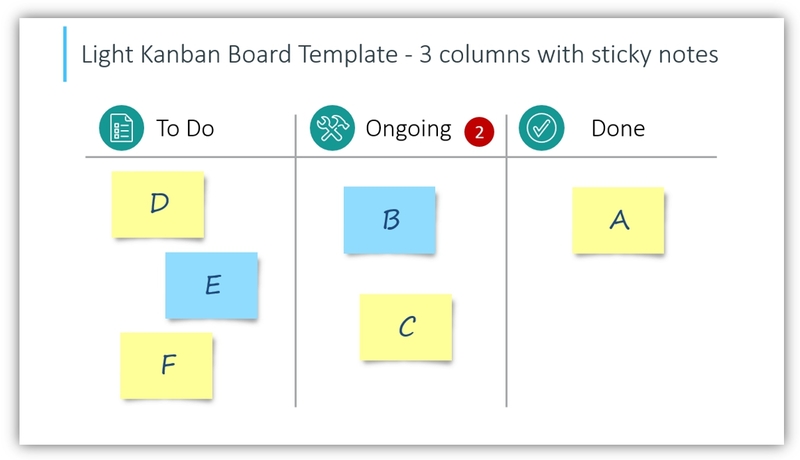 Here are a few examples we developed with our Kanban template. In this example, we used dark blue slide background and light outlined shapes for board borders. This light style is more suitable for printing. You can create a imitation of Post It cards – using the yellow rectangle and adding a small shadow. It works well both on white and black board, too. Sometime the color of shadow needs to be adapted. 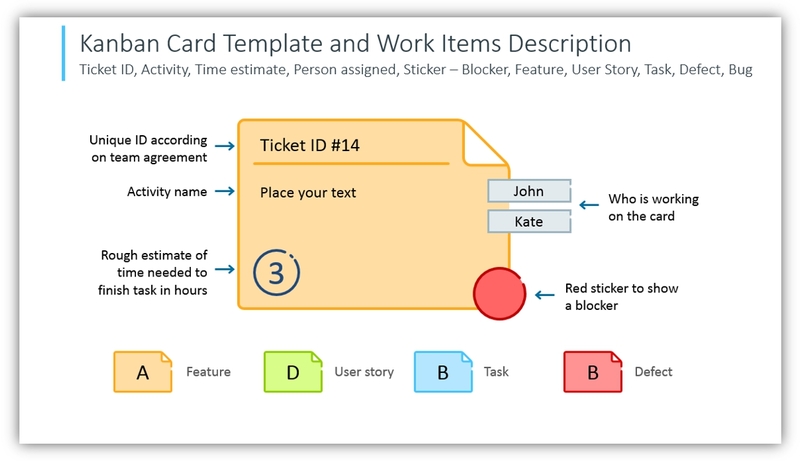 Here’s an example of slide explaining what is on Kanban card. 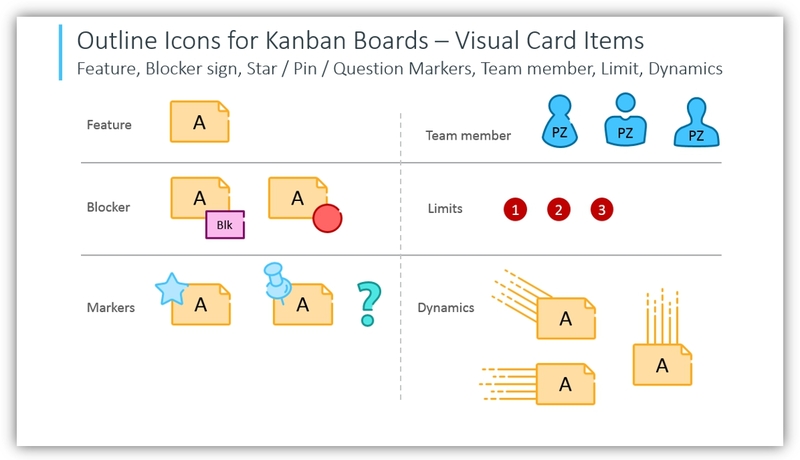 You can develop your own Kanban system, using your color coding and additional icons – such as blocker sticker or other markers (star, pin). Rough estimate of time needed to finish the task. Typically in hours. Feel free to add your own colors, just ensure they are rather light ones and that text on cards has enough contrast to stay readable. The icons follow the line style of boards, to keep the light elegant look of the presentation. You can add dynamics effect to the card by several parallel lines behind the card, that resembles a motion of the task card. As an alternative, you can check the less traditional but personal Creative hand drawn Kanban Boards PPT visuals. If you have feedback concerning the visuals, let us know. We are open to new suggestions.